We are constantly being exposed to infectious agents and yet, in most cases, we are able to resist these infections. It is our immune system that enables us to resist infections. The immune system is composed of two major subdivisions, the innate or nonspecific immune system and the adaptive or specific immune system. The innate immune system is our first line of defense against invading organisms while the adaptive immune system acts as a second line of defense and also affords protection against re-exposure to the same pathogens. ‘Natural immunity’ of a living being is also known as innate immunity, native immunity or inherited immunity. This relates to a general or non-specific type of resistance, which prevents infection by different kinds of pathogens. The extent of this natural immunity differs in different organisms. For example, the viruses that cause leukemia in cats or distemper in dogs don’t affect humans. Innate immunity works both ways because some viruses that make humans ill — such as the virus that causes HIV/AIDS — don’t make cats or dogs sick either. Innate immunity also includes the external barriers of the body, like the skin and mucous membranes (like those that line the nose, throat, and gastrointestinal tract), which are our first line of defense in preventing diseases from entering the body. If this outer defensive wall is broken by an injury, the skin attempts to heal the break quickly and special immune cells on the skin attack invading germs by inflammatory response and phagocytosis. Antiviral proteins like interferon are also secreted by the white blood cells. Actively Acquired Immunity - ‘Actively acquired immunity’ may be either natural or artificial. Actively acquired natural immunity results from any infection from which a person recovers. During the infection, antibody production for that specific pathogen is stimulated so that when there is a subsequent infection by either the same or antigenically related pathogen, the antibodies assist in the body’s defense. Actively acquired artificial immunity is the most common method of immunization or vaccination. The immunogens are injected in the body in controlled quantity to stimulate the production of immunoglobulins. Killed and attenuated strains of bacteria and viruses are now used widely for immunization against many diseases like typhoid, small pox, poliomyelitis, yellow fever, measles, etc. Attenuated organisms produce mild infection and induce natural immunity. Vaccines are also being developed now by a variety of other methods involving recombinant DNA technology. Haptens are small foreign molecules that cannot by themselves induce antibody formation. However, if attached to macromolecules they can elicit the formation of a specific antibody. The attached molecule is called a haptenic determinant, and the molecule to which it is attached is called a carrier. Some medicinal properties are very effective in eliciting the formation of antibodies, and are used experimentally as a haptenic determinant. Homoeopathic medicines act like haptens. ‘Passive immunity’ may also be acquired either by natural or artificial means. 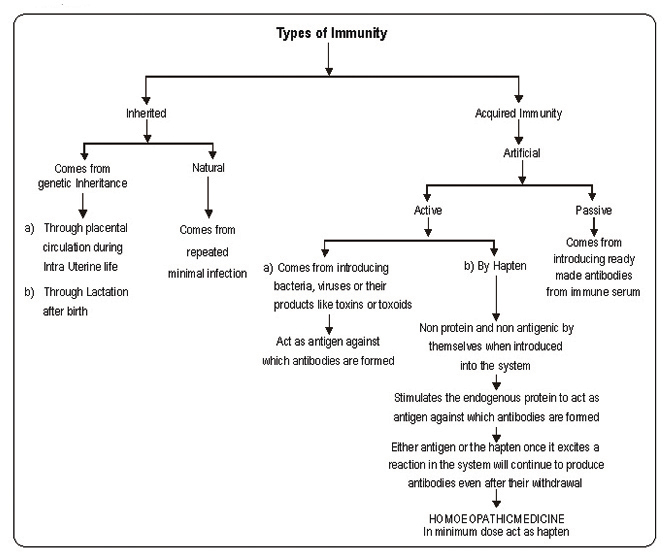 While passive immunity acquired by natural means, involves the transfer of antibodies from mother to her unborn child, through the placenta during the later part of pregnancy, passive immunity of the artificial type refers to the original production of antibodies in some other individual (human or lower mammal) followed by injection of these antibodies with the help of a needle or syringe. Several drug-manufacturing companies are involved in the large-scale production of antibodies in horses and cows by active immunization.